The route starts with a gorgeous cruise along the cycleway that links Tarvisio and Venzone. 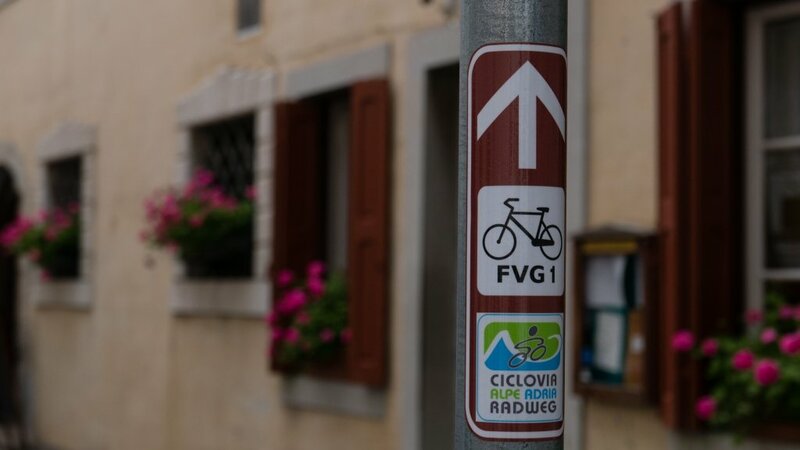 It's one of my favourite cycleways, and, despite its unexciting name (the FVG1), it's one of the best in Europe. Almost entirely traffic-free, and tarmac-surfaced, it follows the Fella river as it flows through the shimmering limestone Julian Alps. As you come into Tarvisio (Tarvis) you pass through the old Tarvisio Citta' station. A little further on, look out for the church on your right-hand side (not that you can miss it really). In particular look for the two round towers with conical roofs; the walls and towers were built around the church in the 15th century as a defensive measure against incur­sions by the Turkish Ottoman Empire. 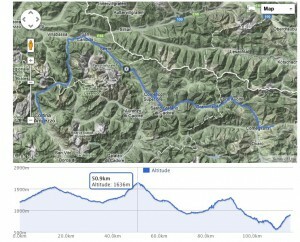 From Tarvisio the cycleway goes gently uphill to Camporosso (820m) before starting the downhill cruise to Pontebba. In 2016 two new sections of cycleway were opened taking you past the new Ugovizza-Valbruna station. If you're looking for a place to eat or a place to stay then you might still want to consider taking the old route that takes quiet roads to Valbruna. 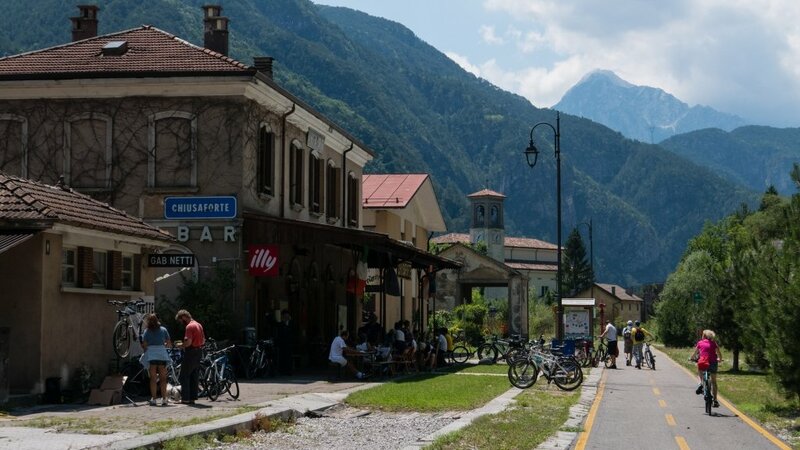 The cycleway also passes in front of the old station at Ugovizzo now reborn as a bar-trattoria (Da Lucia), with a play area if you're travelling with little ones. The two new sections mean that the ride is very straight­forward until almost Pontebba where things get a little more complicated. Just before Pontebba there's a section of the route where you weave in and out of the feet of the motorway viaduct, before coming out onto the Via Deposito which takes you to the bridge over the railway (look out for Pontebba's church). There's then a short steepish descent that brings you out onto the main street in front of the tourist inform­ation office. Turn right and continue over the bridge which, until 1918, marked the border between Austria and Italy. Coming out of Pontebba you turn right just before you reach the SS13 and climb past the chapel (Capella di San Rocco) and then down again and up (I needed to push). There's then a section on the old railway line and then you need to descend again on a ramp, then cycle a short way on the road until you reach a ramp/​​steps. The ramp isn't that steep, and it's a pretty short — so it's no big deal. The complicated bit out of the way, it's plain sailing from here to Resiutta, with a couple of dramatic bridges over the Fella river. At the old Stazione di Chiusaforte there's a friendly bar, restaurant and inform­ation centre Facebook page. They also had a sign advert­ising repair assistance. Up until 2017, the cycleway ended at the old Resiutta station, however, there is now a new section which leads to Moggio Udinese. You can tell where the new section starts, as the lines on the cycleway turn from yellow to white. A little further on, there's the 950-metre-long Cinque Torri tunnel. It's illuminated, but there are signs telling you to turn on your lights. There's then a second tunnel (Ponte di Moggio e Simonetti) which is 650 metres long. At the old station of Moggio, the cycleway comes to an end (although at first sight, it seems to continue) and you need to turn right and take the underpass under the main road, and then the cycleway that takes you to the bridge into Moggio. As I under­stand it, there's no official route between the old station at Moggio Udinese and Venzone. The CAAR website and tracks take to the main SS16, and that's certainly an option. I think that a better choice is to cross the river to Moggio Udinese and from there take an old military road via Campiolo and then cross back over the river further on. After the bridge take the first left, and then left again following the signs for Campiolo (Cjampiul). Note: there are no cycleway signs on this part of the route. Look out for the signs for the Romea Strata hiking route which follows the same course. Also, keep an eye out for stickers put up by the Friends of the Radweg. You cycle past Campiolo and then cross over a bridge and continue on an old military road with a compacted-aggregate surface road. It's very quiet, but it is open to traffic — so keep an eye out for the occasional vehicle coming the other way. The road is in reasonable condition, although it is a bit gravelly with some water damage in places. You should be able to find a reasonable line on firm ground, and it should be doable by most riders with bikes – although people with really skinny tyres may have problems. It's quite a scenic road, but I was quite relieved when the tarmac resumed. The road comes out onto the main SS52. The route continues on the other side — more or less in front of you and a little bit to the left. The crossing over the main road is tricky as there's a bend in the road. Once you're over the main road, the route continues under the autostrada and over the Tagliamento river and on towards Carnia. Coming out to Carnia you have two choices: one is to turn right onto the Strada Pradon, which despite the name, is a track that skirts around fields before eventually bringing you out onto the SS13. Personally, I think you might just as well take the SS13 — which you will have to join further on anyway. The route turns off the SS13 after the village of Portis and onto a quiet minor road. You'll see a number of the houses that had emergency repairs after the 1976 earth­quake. The houses were never reoccupied as the inhab­itants of Portis Vecchia (Old Portis) had to abandon their homes, and build a new village a short distance away. Today there are plans to create a research and training centre to help prepare emergency workers and local author­ities for earth­quakes. You'll also see the 14th-century church was almost completely destroyed in the 1976 earth­quake but has been rebuilt. In 1976 the area was devastated by a series of earth­quakes. The first earth­quake was on the 6 May and then, cruelly, just as people were rebuilding their homes and their lives, by three powerful shocks in September. Almost a thousand people died in the earth­quakes; 18,000 homes were destroyed, 75,000 damaged, and a 100,000 people made homeless. The epicentre of the earth­quakes was near Gemona del Friuli. 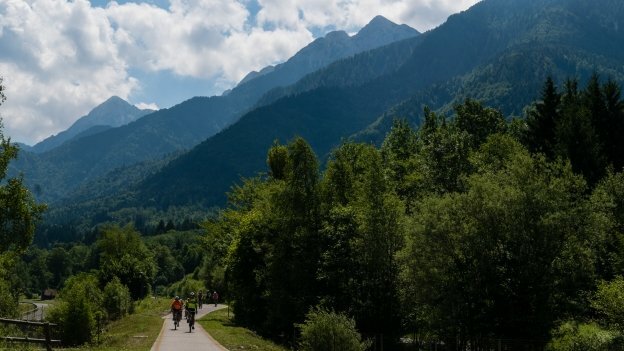 The route between here and Udine takes you through some of the hardest-hit towns and villages — although you'll probably not be able to tell. The route brings you out onto the main road again, but only for 400 metres or so, before you turn right, onto the Via San Leonardo. There's no sign, but there is a CAAR sticker on the signpost, together with a more prominent Romea Strata sign. You then continue, following a quiet country lane. This road takes you into the modern outskirts of Venzone. At the junction (Piazza Dogana) turn left and cross over the bridge and, looking for the bell tower of the cathedral, follow the road into the main piazza of Venzone. Venzone was declared a national monument in 1965, as an example of a walled borgo that is unique in the region. Don't miss its medieval defensive walls, the cathedral (duomo) and the palazzo with its clock and lion of Saint Mark (the symbol of the Venetian Republic). The people of Venzone were determined to rebuild the town "dove era e come era" (where it was, and as it was). The town, and in particular its cathedral, became a symbol for the rebirth of the region. The cathedral (duomo) had to be rebuilt, painstak­ingly, piece by piece — in a corner, there's a photo showing the 8,000 pieces lined up in a field. Fortunately, after the earth­quake in May there had been a photo­graphic survey which helped the recon­struction after the much more destructive earth­quake the following September. 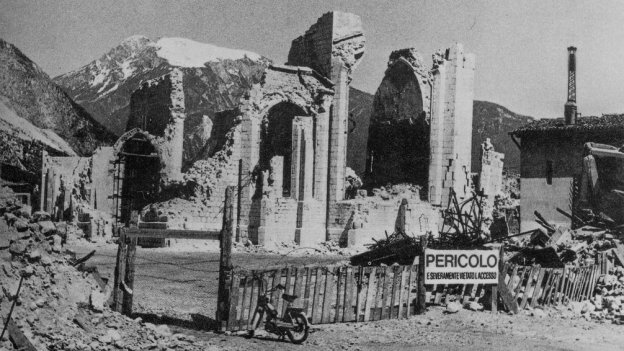 For more about the earth­quake and the recon­struction, and a photo gallery with before and after pictures, see venzoneturismo.it: earth­quake 1976 (it/​​en/​​de/​​fr). There's also this video by Lorenzo Bianchini that has video footage of Venzone and Gemona del Friuli, before and after the earth­quake and as they are today. As if Venzone wasn't already an extraordinary place, the crypt of the Cappella cimiteriale di San Michele next door to the duomo is home to the Mummie di Venzone (Venzone Mummies) — 15 mummified bodies, the oldest dating back to the 14th century. They were mummified by natural processes, but no one knows for certain why the bodies have remained so well preserved. For pictures and more about the theories about their mummi­fic­ation see en.wikipedia.org: Mummies of Venzone. Venzone was used as the location for a number of scenes in the 1957 film of Ernest Hemingway's autobi­o­graphical novel A Farewell to Arms. For more detail, and a gallery of photos see potmiruviadipace.org: A Farewell to Arms Set Photos. the Albergo al Sole in Fusine Val Romana close to the FVG1A as it heads for the border with Slovenija. A friendly, family-run hotel in a great location and a reasonably-priced altern­ative to the hotels in Tarvisio. the Locanda Mandi (which used to be the Ostello del Ciclista) which is very close to the cycleway and quite possibly the best value option in the Tarvisio area. Apart from the beautiful riverside location they also serve really good vegan food. 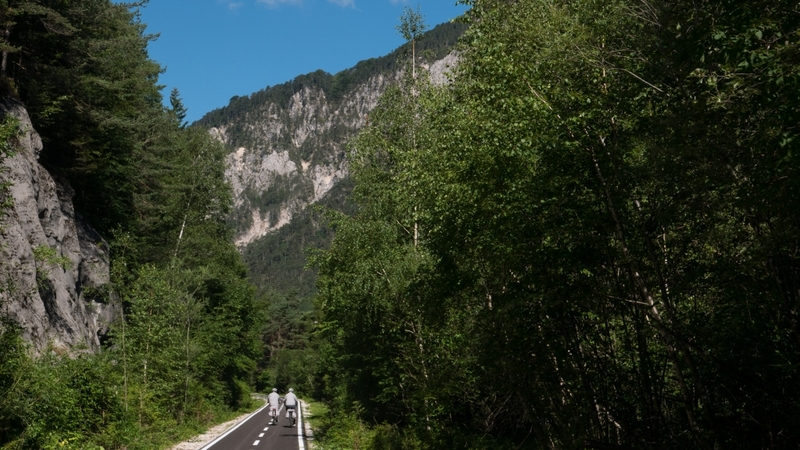 To find it either follow the signs for the Ostello del Ciclista or take the road to the Lago di Fusine. 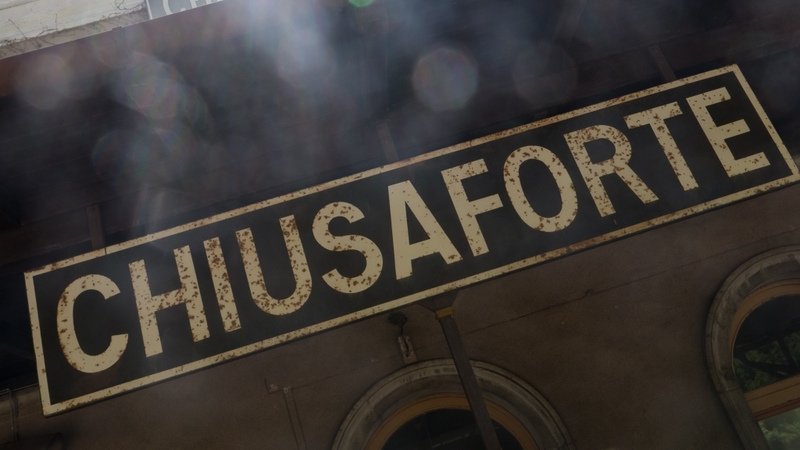 The Stazione di Chiusaforte bar-ristorante has a lot of inform­ation about places to stay in and around Chiusaforte — and beyond. They even kindly offered to help me book somewhere. They also have inform­ation on their website about pistaciclabilealpeadria.it-places to stay in Chiusaforte and an pistaciclabilealpeadria.it-accom­mod­ation listing for the whole section between Valbruna and Grado. The Discover Alpi Giulie website (it/​en) has a compre­hensive, and very useful, accom­mod­ation listing: discoveralpigiulie.eu: ospit­alita. venzoneturismo.it, the tourist inform­ation office website for Venzone (it/​en/​de/​slo/​fr) has a very helpful listing of accom­mod­ation options in the town venzoneturismo.it: Accommodation. I've stayed a couple of times at the Locanda al Municipio which is right in the heart of the town, next door to the palazzo comunale. The locanda has reasonably secure bike storage in a courtyard that is locked at night. At Valbruna there's the Casa Alpina Julius Kugy. There are a couple of hostels at Kranjska Gora. If you're looking for economical options along the way don't despair, there were B&Bs offering rooms at 25€/person a night. There's no campsite on this section of the route, but you can continue on a little further to Gemona del Friuli where there is the Camping Ai Pioppi. The stations on this section of the route are Tarvisio Boscoverde, Malborghetto-Ugovizzo, Carnia and Venzone. Sugli autobus di linea di TPL extraurbani è possibile il trasporto gratuito di 1 bicicletta per passeggero, esclusi i tandem, fino al limite massimo consentito dalle capacità delle bagagliere. A tal fine, è neces­sario informarsi in anticipo sulla possib­ilità di trasporto (fax 0432.602777 e-mail info@nullsaf.ud.it), indicando un recapito mittente anche telefonico, per la conferma che potrà essere data anche nella giornata del viaggio. Passengers can transport bicycles, excluding tandems, on the extra-urban bus services free of charge. One bike per person, and subject to the amount of available space in the luggage compartment. You must contact the SAF in advance (telephone: +39 0432 602 777, email: info@nullsaf.ud.it), giving your address and a contact phone number. You may only receive the confirm­ation on the day of travel. Surprisingly, there are no bike shops on this section of the route, although there are some bike hire places where you might be able to get help. Your best bet is probably the Stazione di Chiusaforte. The last time I passed by, they had a mechanic working there, although I don't know if he is there all the time. If you need an inner tube, there's a Schwalbe vending machine in Pontebba (on the right-hand side just across the bridge). The cycleway passes through Pontebba where there are several bars and Resiutta where there are a couple of bars and a gelateria. Otherwise, the only places directly on the route are the old stations at Ugovizza and Chiusaforte. 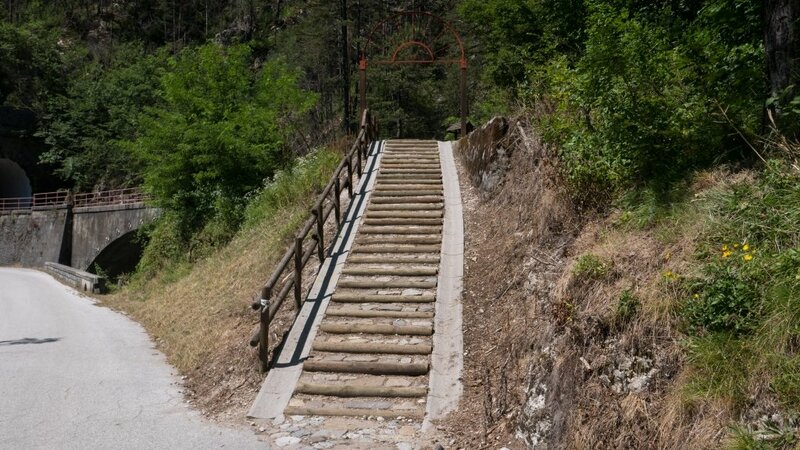 If you don't mind a short detour, there are more places in Valbruna and Moggio Udinese.